(Above) A shot of the business end of the Moy Coire. This was the site of a massive dry slab avalanche on one of our few west aspects back in early March 2010. It’s one of our more remote glens and the upper reaches of it are not visible from the A86. It’s quite a schlep getting in their at this time of year as the ground is quite rough and boggy. Best visited on skis when we have good cover. Those ski tourers familiar with Creag Meagaidh will recognise this as one of the classic descents off the Creag Meagaidh summit plateau. 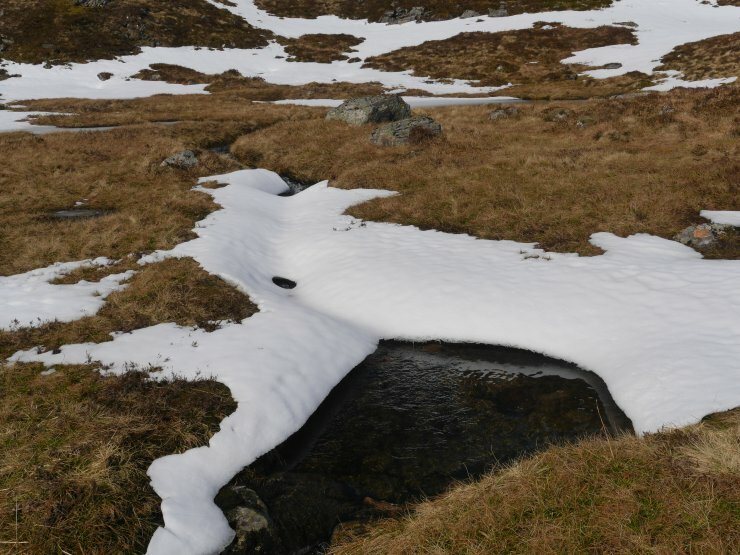 Pick the right line (when the cover’s complete) and its ‘skis on’ all the way from the summit down to the A86. Magnificent! (Above) A few remnants of snow still present down at 700m at the head of the glen. In full melt mode at this altitude. 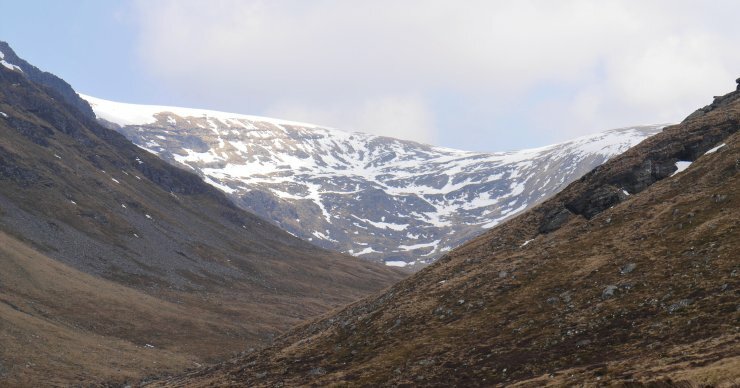 Frosty overnight so those preparing for a wander on the hills involving ascending/descending steep snow early in the morning – especially snow that’s heavily shaded – need to be carrying an ice axe and crampons. Quite warm feel when the sun’s out but let’s not get lulled into overlooking those essential bits of winter kit. Have followed your postings all season and enjoyed some great photos and comments. Thank you. Hi, Stan! Great to hear from you again. Glad you’ve enjoyed the blog and always appreciate your comments. Last report & blog posting for the winter will be tomorrow, Saturday.